I have been performing since I was a child and love to be in the spot light. I never got into the circus scene though until I entered college. I began my start with the Gamma Phi Circus at Illinois State University. Performing in acts: juggling, fire breathing, stilts, hair hang and clowns. I was also the act captain for clowns and stilts. I actively perform in the Triton Troupers Circus at Triton College. 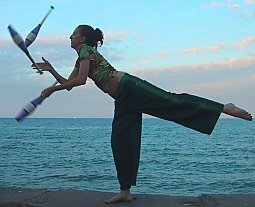 Performing in acts: rolling globe, German wheel, juggling, fire, stilts, and clowns. I was the first to create a fire act for the circus. I have also acted at Six Flags Theme Parks for Fright Fest, Mardi Gras, Kids Fest, Mr. Six promotions, Advertisements, and Television. I am a member of the World Clown Association, Clown Guild of Metropolitan Chicago, West Suburban Clown Club, and International Juggling Association. I absolutely love to perform whenever can, but I have another side. I graduated with my Masters Degree in Social Work. My field of focus is the elderly. I also currently work as a Certified Nursing Assistant in a nursing home and adult day care centers. Please feel free to contact me if you are interested in learning more.